Yesterday was one unusual day for me. Lots of things happened. I started the day as early as 5am doing my daily online chores. I was preparing all the stuff I needed to bring since I knew I was going to be out the entire day. First on my list was to drop by a friend's house to leave a package. It was so early in the morning though that I didn't realize that the shortcut to their village was closed. And so I had to take the long route there. Next stop, Ortigas center, where I would meet up with Jhamie to pick up her digicam which she generously lent me so I could have my own digicam serviced and reparied for a week. Next on my agenda was Pancake House along Pasong Tamo Extension. 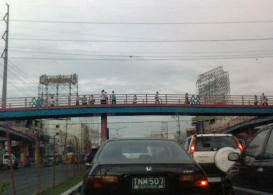 I used to work in the Pasong Tamo Extension area and I certainly didn't want to pass by EDSA that day. With the patience of my friend Tweet, she gave me directions on how to get there using Fort Bonifacio as a backroad. It was a nice change of scenery for me to see lots of trees, nice roads and men in army, navy and military uniforms. It reminds me of the years I've been regularly going to Subic Bay when the US bases were still here. The orderliness and cleanliness of their environment affects you in such a way that it'll make you feel a sense of goodness. Anyway, I was scheduled to meet up with Aileen, the Google Philippines Country Consultant. I met her before when I was a resource speaker for E-commerce. It was nice to exchange ideas and insights with her. When she showed us pics of the Google grounds in Mountain View, it also sparked my long time dream of working at Google as well. Next stop was Hard Rock Cafe to attend the album launch of Pinoy Pop Superstar Gerald Santos. Take note, so far, everything I finished on my itenerary was just an hour's interval apart. So you can imagine what kind of sched I had. I was a bit late but delighted to be greeted by my good media friend Dennise who was alone so I joined her. We had fun chatting while waiting for the program to start. We did get a more-than-usual amount of goodies at the desert table. My partner in crime Dennise, helped me, shall we say, prolong the buffet experience to after the event. :) During the launch, MTV was also present and approached us to ask if we could appear on their request show called "MTV Get Spotted". And so we got to request for a video and greet our friends on TV. It's gonna be shown next week. By this time, I had 2 bags with me, 2 cameras and a laptop. Along with the additional prizes and freebies I got from the launch, my backpack was fully packed. I had a hard time opening and closing it just for security guards to inspect it. Next on my agenda was the main office and service center of Fuji in Quezon City (near Sto. Domingo church) where I was going to have my digicam serviced. This is an hour's drive away from Makati. Good thing Dennise was also headed for that direction and so I had company during the long drive. This is where Dennise and I witnessed some unusual things. First, we saw a very sleek black Expedition which was severely degraded cause a metal container (similar to those tricycles that carry pigs in) had one attached to its rear. It was like a 2 million peso SUV was used to carry some jugs of water and trash. The next weird thing was that we saw a dog trotting along EDSA in the inner most lane. When we came closer to the dog, Dennise and I were both in astonishment that the dog had its face vandalized, almost as its face was tatooed. We jokingly made a silly assumption that the dog must be cool and "astig!" After dropping off Dennise along Quezon Avenue, I surprisingly saw the comedian "Palito" walking along the sidewalk with a lonely face. Nobody was noticing him as he walked towards the overpass. That was weird for me that nobody recognized him or couldn't care less. After more than an hour of driving, I finally got to the YKL/FUJI service center. I left my camera there (with much grief) and was told that it'll be fixed within a week. Next on my list was Sta Lucia East Mall where I was to meet with my assistant for a weekly report and turnover of materials. Getting here from Quezon City took me another hour and so I was really tired from all the driving for the day up to this point. Although not on my agenda, I decided to hang out with my friends over there until mall closing time. Before going home, I had the car washed, cleaned and gassed up ready for today. By the time I got home, it was 11pm and I totally forgot to eat dinner. Good thing you have a car. Imagine the stress kung commute ka lang.hehe.